A Dutch international football player, who plays for Turkish club Fenerbahce as a right back. An Amsterdam guy, he is a product of the renowned AFC Ajax youth system. He plays an attacking right back and is known for his swift runs down the flank. In 2010, Van der Wiel was awarded the Johan Cruijff Award for the Young Player of the Year in the Netherlands. His first was for the Dutch national team in late February 2009 and performed in the Netherland’s runners-up performance at the 2010 FIFA World Cup in South Africa. This dude has some badass tattoos. Let’s check them out! His upper body is inked wholly with tattoos. In the center of his commode, horizontally it is inked, “Love Lives Forever”. Above it, he has got recently a pharaoh inked as a collar tattoo to his body, which is already decorated on his arms, chest, and back. It is in stark contrast to the angels and saints flying around. A pharaoh in the tattoo form is also known as the key of life, a symbol of life, love, and eternity. Also, it symbolizes the optimistic side of culmination, focusing on the calmness, protection, vigilance and due respect that comes with it. It is strikingly different from flying angels and saints, for they mean resurrection, renaissance, rebirth or reformation. It adds hopes to your life and budding aspirations. 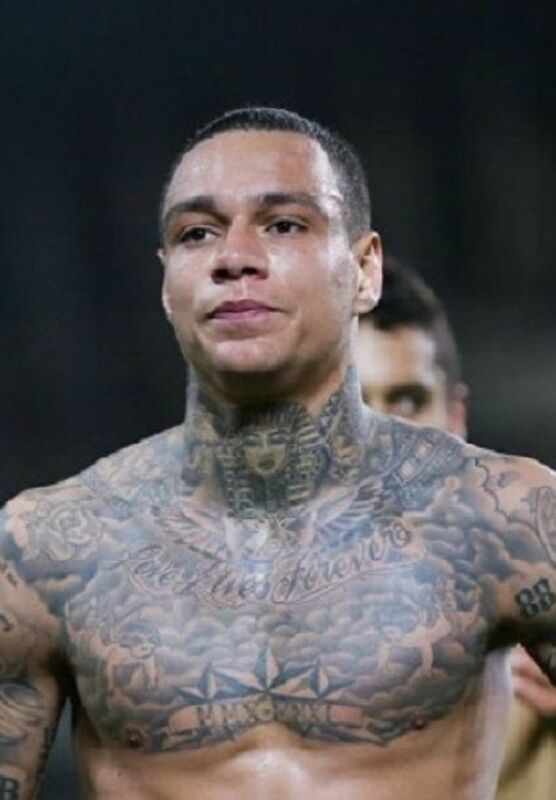 On Gregory van der Wiel’s back, he has got wings inked. Wing tattoo designs usually have inspirational, regenerative or philosophical symbolism for the wearer. In many myths, for example, wings have to be earned. Naturally, if we can say, wings allow birds and insects to fly. So, symbolically they represent speed or velocity of a person. Also, it deals with one’s aspiration to reach for his or her goals or aims.